Introduction: Redo retroperitoneal lymph node dissection (Redo surgery) for the treatment of germ cell tumors (GCTs) is an uncommonly performed procedure. We describe clinical characteristics and outcome of patients disease requiring redo surgery for recurrence or residual retroperitoneal disease. Materials and methods: INCan (Instituto Nacional de Cancerologia) germ cell tumor surgical database was reviewed from January 2007 to December 2012 and clinical features of patients subjecting to re-operative retroperitoneal surgery (Redo surgery) for GCTs were individualized. Preoperative evaluation, histopathology, morbidity, and technical aspects of this procedure, which is a critical part of the management of GCT, are described. Disease-specific survival was estimated using the Kaplan-Meier method. Results: A total of 20 patients were identified who underwent 27 Redo surgery, after post-chemotherapy retroperitoneal lymph node dissection (PC-RPLND). The most common sites of disease in the Redo surgery were para-aortic region. The most frequent histologic finding at time of Redo surgery was teratoma. The median interval to Redo surgery was 12 moths (P25 8.5-P75 14.75). The overall Intraoperative complication rate was 18% and median length of hospital stay was 3days. The 5-year disease-specific survival rate was >55%. Disease-specific mortality for patients underwent to Redo surgery was 40% (n=8). Conclusion: Redo surgery is integral component of management of GCTs in cases of retro peritoneum recurrences of failures; it is the last opportunity for cure. Clinical outcomes after repeating retroperitoneal surgery depend on re operative histology. Testicular cancer represents 1-1.5% of all male cancers in Western society  and it is considered as highly curable even when the disease is advanced. In Mexico there are no reliable records of the true incidence; histopathological malignancy record of 2001, 1186 documented cases, representing 2.4% of malignancies in men and despite the high probability of cure, were reported 299 deaths . According to EAU and NCCN guidelines, the standard therapy for clinical stage II-IVGCT is chemotherapy matched with surgery. Surgery, when combined with systemic chemotherapy has resulted in a long-term disease free survival high for patients with advanced GCT . After chemotherapy, retroperitoneal lymph node dissection (PC-RPLND), retroperitoneal recurrence occurs in2-3% of patients . Natural history of recurrent retroperitoneal masses is poorly known; nevertheless retrospective data prompt surgery management . Indications to resect recurrent or residual retroperitoneal masses are retroperitoneal residual disease after retroperitoneal lymphadenectomy and chemotherapy, tumor markers normal and evidence resectable tumor. Risk factors for retroperitoneal recurrence after primary RPLND and/or PC-RPLND are in adequate initial surgery and incomplete teratoma resection; faulty primary surgery was not compensated by postoperative chemotherapy. Redo surgery is a significant component in the therapeutic algorithm of non-seminomatous germ cell tumor, resulting in overall survival rates of 55-67% [6,7]. Were port the clinical presentation, sites of tumor recurrence, pre- operative and histologic finding, operative data (time and transfusion rate), and adjunctive procedures required for redo surgery, overall and disease free survival a tour institution. 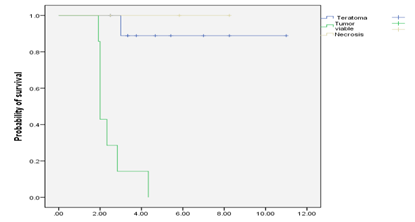 A total of 181 post-chemotherapy retroperitoneal residual mass dissections for metastatic non-seminomatous or seminomatous testis cancer were performed for GCT from January 2007 to December 2012 and entered prospectively into the Instituto Nacional de Cancerologia (INCan) of Mexico City GCT surgical database. From this database, we identified as having undergone 27 re operative retroperitoneal procedures (Redo surgery) for non-seminomatous GCT (NSGCT) after prior retroperitoneal surgery. The term Redo surgery is used to describe any re-operation after a PC-RPLND or mass resection after any form of previous retroperitoneal surgery for GCT, including RPLND, node sampling, or mass resection for recurrence or previous failure surgery. Late recurrence was estimated as retroperitoneal relapse within 2 years of Initial treatment. Initial surgery (PC-RPLND) was defined as complete when reported complete excision of all residual masses with no recurrence within 1month of surgery; and incomplete resection was considered as residual masses defined unresectable or new elevation of tumor markers within 1 month of surgery. Before repeating RPLND patients received platinum based chemotherapy. Preoperatively all patients were evaluated by physical examination and computed tomography of the abdomen and the chest. In case the venacava was not visible due to large tumor mass an angio- MRI was performed in order to exclude the presence of a vena caval tumour thrombus. CT-guided needle biopsy not was performed. Serum tumour markers (α-fetoprotein and β-HCG) were measured in all patients. The procedures were performed via mid line laparotomy and via thoraco- abdominal. Patients were followed at regular intervals. Detailed information was compiled, including tumor site at first resection and at redo procedure, initial clinical stage, interval to reoperation, histopathology findings of previous PC-RPLND and redo surgery, adjunctive procedures and peri-complications at time of Redo. Viable tumor was considered as GCTs (except teratoma) or other malignancy Histology in pathological specimen. Redo-surgery was performed by one same surgeon. Disease-specific mortality and disease-specific survival was calculated using the Kaplan-Meier method, starting from the date of or chiectomy (diagnosis). A total of 20 patients who underwent 27 reoperations were identified from the database of 181procedures. The 20 patients had a mean age of 24, 75(±5.29) years. The initial operation was post-chemotherapy retroperitoneal lymph node dissection (PC-RPLND), none primary RPLND. The initial clinical stage was Stage I in 2 patients (10%), Stage II in 6patients (30%) and Stage III in 12patients (60%). The primary tumor was left sided in 11 cases and right sided in 9 cases. Mixed tumours were the most frequent histology of the primary tumor (18 patients), one case of mature teratoma and one of Endodermal sinus tumor. The median observation time after the initial diagnosis was 38 months (P2529.5-P7566.3 months). Twenty patients were classified based on the IGCCCG risk criteria: 6 with good-risk, 7with intermediate, and7with poor-risk disease. Four patients were subjected twice to Redo surgery and one patient to three times for recurrence. The disease specific sites of recurrences are listed in (Table1). The most common sites of masses prompting redo surgery were in the para-aortic area in13 (48.1%), followed by the inter-aortocaval. Table 1: The median diameter of the retroperitoneal mass at the time of the first surgery was 5.5cm (P254-P759cm) and for Redo surgery was 4cm (P253-P757cm). Serum tumour markers (a-fetoprotein and r3HCG) were negative before Redo surgery in all patients. We found viable malignant germ cell tumor in 6 cases, teratoma in 10cases and complete necrosis in 4 of the PC-RPLND specimen. Nine patients (33%) at Redo surgery (27procedures) had viable tumor, 14patients had teratoma (51%) and 4 necrotic tissue (14.8%). Malignant transformation was described on re-operative pathology in two cases: one case of necrosis was found to have sarcoma in Redo specimen and on teratoma turned into adenocarcinoma. Four patients who had no nodal involvement after PC-RPLND (necrosis) were found to have one teratoma, two viable tumors and one necrosis. Three patients had viable tumor in the original PC-RPLND specimen were found to have no viable tumor in the Redo surgery; and two patients with teratoma in the first specimen were found with viable tumor in the repeated surgery (Table 2 & 3). Table 2: Histology of Redo surgery. 2 patients had received 3cycles PEB, 12patients 4cycles PEB, 5had received 3 cycles PEB and additional chemotherapy regimens with vepeside, ifosfamide, and cisplatin (VIP), one patient didn't receive chemotherapy. After PC-RPLND, additional chemotherapy was administered to 9 patients for viable cancer in the resected specimen or pure solid masses with characteristic CT-features of non-seminomatous germ cell tumour elements. The initial surgery was completed in all cases, only one was considered incomplete. The median interval to redo surgery was 12moths (P25 8.5-P75 14.75). One case of redo surgery was considered unresectable. There was intra-operative complications with adjunctive procedure sin five patients (18.5%), including nephrectomy (n=2), ureteral injury (n=1), injury of inferior vena cava (n=1), aortic injury (n=1). Adjunctive procedures were performed by the urologic surgeon, only aortic graft by vascular surgeon. There were neither early nor late complications. The perioperative transfusion rate was 22.2% (6/27). Median operative time for Redo surgery was 135minutes (P25 80-P75240), median hospitalization time was 3 days (P252-P754). At mean follow-up of 4,31years (range1.92-11), the disease specific mortality rate for the entire group was 40% (8pts). Table 3: Prior to RPLND patients underwent chemotherapy. Table 4: Prior to RPLND patients underwent chemotherapy. The disease specific mortality rate for patients with necrosis/fibrosis was 0%, with mature teratoma 10%, and 100% for patients and vital cancer in the resected specimens, respectively. At the last follow up, 60% of our patients were a live including 9patients with teratoma and 3with necrosis in Redo surgery. The disease specific survival for the entire group of patients was significantly dependent on the histologic findings at time of Repeat RPLND. Disease-specific overall survival at follow up of 5years was>55% (Figure1 & 2). Figure 1: A plot of time vs probability of survival. Figure 2 : A plot of mortality rate vs probability of survival. There are few series reported of Redo surgery, reason why our experience is described our experience of this procedure. Indications for Redo RPLND include: residual or recurrent retroperitoneal mass after initial RPLND or PC-RPLND, normal tumour markers (α-fetoprotein and β-HCG), otherwise negative metastatic workup, and evidence that the mass is resectable. Patients who undergo in primary or post-chemotherapy retroperitoneal surgery may develop recurrence in retro peritoneum and unresectable disease . Retroperitoneal recurrence is infrequent after RPLND and it seems to be under reported occurrence . Majority of relapses in patients With GCTs occur within 2 years of initial treatment, only in 2-4%of cases may present later . 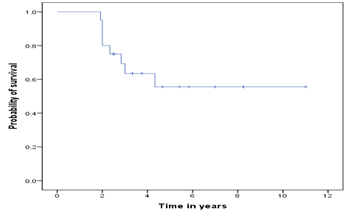 In the present study, only one patient with intermediate-risk non seminomatous GCT, who had stage II A disease (para-aortic), developed late relapse, in region retro crural, 8years after complete response of the initial tumor. Pathologic analysis of the Redo resected specimens in this patient, revealed elements of teratoma mature. Only one case of our series had no relapse, but residual tumor, because it was considered unresectable to primary surgery. One case is described of malignant transformation of teratoma in adenocarcinoma after 12months to the first Redo surgery; the patient died for liver and lung progression after 13months of the last Redo surgery. Late recurrences with teratoma malignant transformation have been reported and it has been associated with poor prognosis [10,11]. Not with standing there no reports describe malignancy histology in repeat surgery with fibrosis/ necrosis in primary or post-chemotherapy retroperitoneal, a sour case of sarcoma that it presented necrosis at first surgery. McKiernan et al. reported that only one patient with fibrosis on initial PC-RPLND, he was found with malignant teratoma on re operative pathology. As noted for the first time by Comisarow et al. in 1976, recurrence retroperitoneal disease requires re operative surgery or salvage chemotherapy. However the chemotherapy had limitations because relapses tend to be chemo resistant . Results of published series demonstrate that insufficient initial surgery can not compensate by chemotherapy [7,13,14], so it makes evident that repeat surgery is the last chance of cure for the patients. Completeness and adequacy of retroperitoneal resection is a independent predictor of clinical outcome. As well demonstrated complete primary resection of retroperitoneum is important to implement relapse-free survival . Also there are two factors associated with local recurrence at lymph node dissection were incomplete lumbar vessel division and teratoma histology after initial retroperitoneal lymph node dissection . In our study the most common histologic finding at both PC-RPLND and redo surgery was teratoma and that it may explain the number of reoperations of our series, which it is equivalent with the data given by McKiernan et al. and Willis et al. . In contrast, the series published by Heidenreich et al. reported teratoma only 6 of 18 patients (39%) and necrosis/fibrosis (47%) as most common histology at repeat surgery. The conclusions of present series in combination with data described by previous groups [7,13] showed that disease specific survival was dependent on tumor histology. Re operative histology was a significant predictor of disease-specific survival. DSS reported for teratoma histology is 80-85% and for viable tumor is 44-50% [7,13]; Our survival results are similar to 56% survival rate of the MSKCC experience at a median follow-up 29.5 months . Overall survival rates in redo surgery are lower than initial PC- RPLND . In our series 9 patients had viable malignant cells in the Redo surgery and 8 of these 9 patients died secondary to wide spread metastases. The most common primary site was the left test is, this predominance corroborate the most frequent para-aortic location of retroperitoneal masses requiring Redo surgery. These trends are yet given in the literature, it is widely described the prevalence of left para-aortal, left region hilar area in retroperitoneal recurrence. The high incidence of retroperitoneal failures in these regions can be attributed, according the authors, to inadequate surgical technique [13,14-17]. Post-chemotherapy retroperitoneal surgery and Redo surgery are technically challenging procedures with great risk of complications due to peri tumoral desmo plastic reaction, adhesions related to previous surgery and chemotherapy and no clear dissection plane remains between the vascular wall and the tumor. Those factors' risk increases the possibility of adjunctive procedures, as nephrectomy, resection of visceral structures and vascular surgery. Involvement of vascular structures can occur requiring performing an enbloc resection of the retroperitoneal tumor with the involved vascular structure. Also patients' status with compromised pulmonary, renal and nutritional reserves enhances risk of intra operative and perioperative complications. In our series, adjunctive procedures for complication was necessary in 18,5% of all patients, which is similar to data reported by Sexton et al. who described adjunctive procedures in 2/21patients; but in others series was 59-71% of patients [4,7]. Nephrectomy is the most common adjunctive procedure achieved in repeat surgery . Retrospective studies reported that the transfusion rate ranged between 18 and 71% [7,17], perioperative complications 9-57%. Common post operative complications described were chylousas cites, prolonged ileus, lymphocele, deep vein thrombosis, ureteral injury and vascular injury requiring graft reconstruction [7,13,17]. Albe it we are aware that redo surgery is the complicated procedure, our series argue that repeat retroperitoneal surgery can be carryout safely without perioperative morbidity. The literature described that re operative retroperitoneal surgery can be performed with acceptable morbidity. On the basis of our findings, it is necessary to prolong the follow- up for detection of late relapses or failures in patients who underwent initial sub optimal retroperitoneal surgery. Recurrence residual retroperitoneal of GCT disease must be treated with redo surgery, when chemotherapy previous surgery fails, thinking that can growth viable tumor teratoma. In this scenario it is the last chance cure for patients with advanced disease, although the overall survival rates is lower than initial RPLND. Clinical outcomes after repeat retroperitoneal surgery depend on re operative histology. Redo surgery is not a routine procedure, it is complex and it should be carried out in a specialized center in order to management possible Intraoperative complications. Albers P, Albrecht W, Algaba F, Bokemeyer C, Cohn-Cedermark G, et al. (2014) Guidelines on testicular cancer. Eur Urol 4-56. Rizo P, Sierra MI, Vazquez G, Guadiana MC, Garcia AM, et al. (2007) Registro Hospitalario de Cancer: Compendio De cancer 2000- 2004. Cancerologia 2: 203-287. Daneshmand S, Albers P, Fossa SD, Heidenreich A, Kollmannsberger C, et al. (2012) Contemporary Management of Post chemotherapy Testis Cancer. Eur Urol 62(5): 867-876. Heidenreich A, Albers P, Hartmann M, Kliesch S, Kohrmann KU, et al. (2003) Complications of primary nerve sparing retroperitoneal lymph node dissection for clinical stage I nonseminomatous germ cell tumors of the testis: experience of the German Testicular Cancer Study Group. J Urol 69(5): 1710-1714. Murphy AM, McKiernan JM (2009) Re operative retroperitoneal lymph-node dissection for testicular germ cell tumor. World J Urol 27(4): 501-506. Donohue JP, Leibovitch I, Foster RS, Baniel J, Tognoni P, et al. (1998) Integration of surgery and systemic therapy: results and principles of integration. Semin Urol Oncol 16(2): 65-71. McKiernan JM, Motzer RJ, Bajorin DF, Bacik J, Bosl GJ, et al. (2003) Reoperative retroperitoneal surgery for non seminomatous germ cell tumor: clinical presentation, patterns of recurrence, and outcome. Urology 62(4): 732-736. Sheinfeld F, Sogani P (2007) Reoperative Retroperitoneal Surgery. Urol Clin North Am 34(2): 227-233. Ehrlich Y, Rosenbaum E, Baniel J (2013) Late Relapse of Testis Cancer. Curr Urol Rep 14(5): 518-524. Carver BS, Shayegan B, Serio A, Motzer RJ, Bosl GJ, et al. (2007) Long-term clinical outcome after post chemotherapy retroperitoneal lymph node dissection in men with residual teratoma. J Clin Oncol 25(9): 1033-1037. Nguyen CT, Stephenson AJ (2011) Role of Post chemotherapy Retroperitoneal Lymph Node Dissection in Advanced Germ Cell Tumors. Hematol Oncol Clin North Am 25(3): 593-604. Comisarow RH, Grabstald H (1976) Re exploration for retroperitoneal lymph node metastases from testis tumors. J Urol 115(5): 569-571. Heidenreich A, Ohlmann C, Hegele A, Beyer J (2005) Repeat Retroperitoneal Lymphadenectomy in Advanced Testicular Cancer. Eur Urol 47(1): 64-71. Willis SF, Winkler M, Savage P, Seckl MJ, Christmas TJ (2007) Repeat retroperitoneal lymph-node dissection after chemotherapy for metastatic testicular germ cell tumour. BJU Int 100(4): 809-812. Donohue JP, Thorn hill JA, Foster RS, Bihrle R, Rowland RG, et al. (1995) The role of retroperitoneal lymphadenectomy in clinical stage B testis cancer: the Indiana University experience (1965 to 1989). J Urol 153(1): 85-89. Pedrosa JA, Masterson TA, Rice KR, Bihrle R, Beck SD, et al. (2014) Re operative Retroperitoneal Lymph Node Dissection for Metastatic Germ Cell Tumors: Analysis of Local Recurrence and Predictors of Survival. J Urol 191(6): 1777-1782. Sexton WJ, Wood CG, Kim R, Pisters LL (2003) Repeat retroperitoneal lymph node dissection for metastatic testis cancer. J Urol 169(4):1353-1356.